Among the hypotheses conceived by scholars about the possible manufacturing processes employed by 16th and 17th centuries string makers to produce all-gut bass strings, that of loading the gut by means of appropriate treatments deserves serious consideration, on the ground of direct and indirect confirmations at our disposal. This confirmations homogeneously coming from different fields, each on its own account, allow us to sketch an altogether sufficiently clear picture of how, in the 2nd half of the 16th century and for over a hundred years, the problem of acoustical performance of all-gut bass strings could have been solved by ancients. As it is well known, when, in an attempt to perform renaissance and baroque repertoires observing philological criteria, modern gut strings are employed for the lower registers of plucked and bowed instruments, they unequivocally give a very poor acoustical performance. As a consequence, when performing musical material from these historic periods, we are always faced with an all but negligible paradox, stemming from the fact of having unavoidably to employ overspun strings for music conceived before their historic appearance. With some families of instruments, such as viola da gamba the problem of acoustical performance for modern gut strings begins normally to appear already beyond the 4th string, rapidly to became more serious for the lower ones. With lutes, the consequences are even more striking, and begin to appear, roughly, after the 5th course and particular in the lower ones, especially if all lying over one neck of limited length, such as, for instance 11 course baroque lutes. A very good example of which appears in the famous portrait of lutenist Charles Mouton (1). The hope of unravelling the mystery behind the manufacturing techniques once used to produce all-gut bass strings (which after the introduction of overspun strings, were to fall in progressive and irreversible neglect) spurred an intensive research on the part of scholars who, once ascertained that modern thicker strings are rather stiff, thought that the heart of the problem was to be sought in the twisting process commonly employed today, which does not allow a sufficient degree of elasticity; an important parameter to make a string sonorous (2). The amount of twist thus began to be considerably increased, seen that it allowed some increase in the elasticity of the structure (3). Unfortunately, in the region of the lowest frequencies such procedure proved insufficient. So other more complex twisting methods were adopted (4)(5), some of which reproduce exactly the structure of a rope. By proceeding in this direction a noticeable decrease in the string’s stiffness was finally arrived at the cost of loosing its smoothness, which is at odds with many written and iconographical sources of the 16th and 17th centuries. This caused some dispute about the historical reliability of such a manufacturing process (6). This, in short, can be considered the state of experimentation which is certainly made more difficult by the fact that no old string from the 16th or 17th centuries seems to survive today. Likewise, very little of technological significance comes to us from treaties of the past and from recently discovered string makers statutes (7)(8). The string makers’ secrets were carefully guarded, an easily understandable attitude in times when there were no certain commercial guarantees, while fraud lied constantly in ambush. In the string makers corporation statute in Rome(1642) and Naples (1653 and 1685) for example, the only technologically relevant information seems to be the prohibition to shear (longitudinally?) gut and what the size the frames should be. In fact, most chapters deal with prevention and repression of frauds. 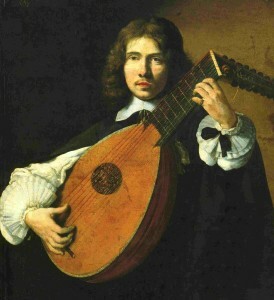 The hypothesis that the loading of gut could have been the common and relevant characteristic of bass strings employed between 16th and 18th centuries found its way in the light of some data recording, which afterwards became systematic, of bridge holes sizes from historic lutes built before, or very close to 1664, year to which the earliest surviving historic report of overspun strings date back to (9). It should be underlined, however, how scant and scattered the spreading of the new type of strings must have been, probably on the ground of the habit musical taste, and the fact that traditional bass strings in the face of the novelty, kept being competitive. T. Mace (10) over ten years after J. Playford’s announcement, make no mention of them. J. Talbot (11) by then prefers to use conventional bass strings, and so does L. Mozart who well into the 18th century, implicitly excludes, in his 1756 violin tutor, the use of overspun strings. For the lute the bond to old habit remains very strong. Gut bass strings of “… a deep dark red colour …” (12) can be seen in a portrait by the berliner painter A. Pesne (1678-1758) painted around 1740-2 and now in the Schloss Charlottenburg, Berlin, portraying the graceful Eleonore von Kayserling playing a 13 courses German theorbed lute, probably tuned in D minor. Thus, on the ground of such observations, some of the original instruments examined are from a few decades after the watershed implicitly established by Playford’s announcement. In practical terms the lowest courses’ hole diameters in original instruments bridges were found to be so small as to allow no all-gut string passing through them a sufficient working tension and therefore a sufficient sonority, a sonority moreover only granted to strings possessing a high degree of elasticity such as rope structured ones for instance, since plain gut strings, even at working tension considered correct, proves to be totally unusable. In table 1 some significant examples of very accurately measured instruments are recorded. These lutes were presumably tuned in renaissance tuning, possible doubts or further remarks are recorded aside. The low strings holes were measured by means of rods of increasing known diameters, thus the maximum passing diameter was found. When examining these data it must be borne in mind that we are dealing with bridge holes diameters and not strings diameters, which were bored by the lute maker with some amount of empirical oversize. In spite of this handicap, the results are absolutely surprising. he general equation for strings, it can be inferred that the product of this critical frequency by the string vibrating length (in meters) is a constant K (breaking index). Such relation when expressed in other terms ( ) allow to quickly calculate the theoretical upper limit at which the cantino of each historical instruments examined will break. The common procedure for tuning a lute (or a viola) for solo playing in 16th century was, as well known, to tune up the treble, empirically, to the highest possible pitch, stopping short of breaking (i.e. before reaching its breaking point). In other words one aimed for the highest working frequency a given string vibrating length will allow. Keeping slightly below breaking frequency, ancient musicians obviously aimed for an acceptable compromise between the top string’s playing life and the safeguard of the best acoustic performance of the all-gut lower registers. For instruments with a defined nominal pitch-tuning it is to be expected that the procedure could have taken a perfectly specular route, exploiting, in practice, the maximum string vibrating length which the breaking point, or rather the breaking frequency allowed. Thus at playing pitch the treble worked in any case close to the breaking. Such a hypothesis finds confirmation in the estimates made on the lute depicted in M. Pretorious “Syntagma Musicum”, Wolfenbüttel 1615-20, where the product of frequency by vibrating length is (15). Basing themselves on these concepts several scholars today suggest that working at 2-3 semitones below breaking frequency may be considered a reasonable choice (2)(16). For our table it was decided to work at two semitones below the breaking frequency of each historic instrument. Bearing in mind that the internal between courses are constant, it was the possible to assign each course a definite frequency. It is worthwhile to remind that under these working condition a chantarelle, no matter what its breaking is, exploits some 80% of its total strength “reserve”. In absolutely empirical terms, it may be assumed that at more then 4kg tension, at the strings lengths examined, a string becomes too stiff to sound, played with finger pads, with “grace”and “full pearls” (17). At tensions lower than 2.5 Kg the “focus” of the note produced (basic frequency with its baggage of higher harmonics) becomes decidedly imprecise, especially with fairly thick gut strings, where the inner damping coefficient is rather pronounced. The treatises of the past confirm for their part that the strings should feel neither too stiff nor to slack to the touch (15)(18); for sheer convenience, the value of 3 Kg was chosen, a working tension at which there is a tendency to play today. Column A: the diameter (in mm) which a traditional plain gut string (a) or a rope-construction one (b), at 3.0 Kg tension should possess in order to produce the corresponding working frequency, assuming a treble, working at two semitones below breaking point. Column B: the specific weight which strings passing through each bridge hole, at 3.0 Kg tension, should possess for a working frequency assigned to bass, according to the above mentioned criteria. As can be easily noticed, the densities so obtained are rather higher than those of the two types of strings considered. Column C: the tension in Kg each type of strings (a or b) would have at diameters equal to those recorded from original bridges. This last column looks rather interesting, since the only significant variable is represented by the breaking point of gut, which in turn determines the working frequency to assign to each bass course. For sheer curiosity we have considered also the mean value of the breaking point of specimens of current commercial strings (sheep and beef) which is 34 (they range between 31 and 38 ) but the resulting working tensions were for the most part below any acceptable value. Finally, the hypothesis was considered that treble strings of the 16th and 17th centuries may have been remarkably stronger than those available today, in order to allow, at equal vibrating length, a higher pitch and therefore move the working tensions up to a range of values which could be judged acceptable. Through the string equation, it was estimated that it would be necessary to reach a breaking point of at least 40 to 48 , which seems frankly excessive. Being the product between the vibrating length and the breaking frequency (or the working frequency) for the cantino a constant, we can assume that the same product for each course is a constant as well, so the knowledge of the vibrating length becomes inessential to determine some important parameters as the specific weight and the working tension. Thus is sufficient to know the bridge hole diameter to obtain what is necessary, and is no more a possible source of doubts the possibility that in the past some bridges of the historic instruments observed could have been moved in a new position, different from the original one. For baroque lutes with a d-minor tuning, the influence of the breaking point of gut on the data processing looses completely significance. The top string of these instruments is always nominally defined as f‘, whose actual frequency depends solely from the pitch standard in use, for example kammerton for German lutes in the 1st half of the 18th century (20). In table 2 examples are recorded of this type of lutes; the method used is substantially different from the preceding table, owing to the fact of being able to define more accurately the nominal pitch of each course. In order to be able to assign them an accurate working frequency, the whole range of frequencies was taken into account, which scholars have considered as valid pitch standards in use in Europe in the 17th an 18th centuries, with particular attention to France and Germany; a range of frequencies, which is in any case included, between a minimum of zero semitones (0s) and a maximum of two semitones (2s) below our present standard of 440 Hz (21)(22). A simple check using the method of table 1, suggests anyway to exclude some values in the higher side (0s, and 1s for vibrating length greater than 0.71 m). With the vibrating length of baroque lutes we would have a breaking frequency for the top string too close to these values. Thus parameters computed for a frequency standard referred as 0s (and 1s for vibrating length greater than 0.71 m) assume a purely speculative meaning. The great importance of this table must not be overlooked, owing to its being in no way dependent on the breaking point of gut, a fact which drastically reduces the degree of uncertainty of the processed data. Column C for instance, is only conditioned by the standard pitch assumed as basis. The specific weight used for these calculations is that of a rope-construction string. The information given by Baron (top string equal kammerton f‘) suggests some considerations on the breaking point of treble strings in the 18th century. A large number of surviving instruments from that period have a vibrating length of between 0.70 to 0.72 m Assuming a top string working at two semitones below breaking point (by which it should last 3-4 weeks before breaking, in accordance with both modern and Baron’s indications) at the frequency range hypothesised by scholars for German kammerton (a’ = 440 ÷ 390 Hz) it is simple to calculate a breaking point “window” of 32÷36 (23), that is remarkably close to those measured in modern commercial gut strings. By following the same procedure it is possible to try and work an estimate of the breaking point of the treble strings of the 16th and 17th centuries. Several lutes built in Venice in the last 16th and the first half of the 17th centuries, surviving today, have a string vibrating length of between 0.57 to 0.59 m (24). With two semitones margin below the breaking frequency limit suggested as venetian pitch standards of that period (450 ÷ 466 Hz), which seems to have kept rather stable in that time span (21), a range of breaking points is obtained of between 33 to 36 , the assumed pitch being ‘ for the chantarelle. Assuming an a‘ pitch instead, the breaking point values rise to 38÷40 .. These deductions represent yet another positive support to the table 1 data. A general characteristic consequent to the loading of gut is that of requiring no particular twisting techniques since the high specific weight increase, by noticeably reducing the working diameter produces a remarkable decrease in the string’s stiffness. The strings keep a smooth surface, in accordance with iconographic sources dating from the turn of the 17th century a good emblematic example of which is represented by the painter Evaristo Baschenish (1617-1677). He always depicted very curl strings on musical plucked and bowed instruments, and the length of string in excess and not in use, bundled up as though were of pliable cord (a detail not to be overlooked in our investigations; our modern strings, on the contrary, besides being impossible to bundle up in such a way without damage, they stick out of peg boxes as straight as pins) and also always depicted them having a smooth surface. Possible doubts about the accuracy in reproducing from life can be cleared by a painting in Palace Pisani-Moretta in Venice: besides the usual musical instruments whose smooth strings are clearly visible, at one side, lying on a tambour, is a tailor’s spool where on the thread is a typical rope structure. A second important indication coming from the 17th century iconography, is the colour of the lower registers strings. It must be said incidentally, that colour can not be taken on itself as a decisive confirmation of gut loading. In fact it is quite possible to increase the weight of the material even considerably, without changing the colour of strings to such an extent as to be noticeable on a painting. Besides, some dyeing processes in use in the 16th and 17th , especially for thin strings (see T. Mace and J. Dowland) aimed for purely aesthetic results. In any case, in the realm of the chromatically distinctions, iconography provides generous and important contributions, especially when taken in relation to other information available today. Thus low strings often appear to be blackish, brown or red coloured, in short, colours which are totally different from the natural colour of gut, and they begin to appear exactly where the acoustic shortcomings of plain gut would make themselves manifest. The already mentioned C. Mouton’s portrait, and that of the anonymous 17th century lutenist in the Kunsthalle, Hamburg are very good examples (25). Red bass strings, starting from the 6th course down, of apparently reduced diameters, suggest a use of colour which is not aesthetic, but simply a consequence of loading process, obtained perhaps with cinnabar, a heavy red mercury sulphide, which was an abundant raw material in some areas of central Italy, the same, in fact, where such a commercial type of bass strings were manufactured: the “pistoys” (9). As far as bowed instruments are concerned, the best among many example available are two paintings from the second half of the 17th century by a Dutch painter in the German National Museum in Nuremberg. In these works a number of plucked and bowed instruments are depicted, probably life size, among which a (bass?) viola da gamba and a smaller one (soprano?) deserve special attention. Both instruments’ 6th, 5th, 4th and 3rd strings, are fairly dark colour. The thickest string being almost black, while the two top ones, much lighter, are exactly the same colour of the frets. Lazzari (second half of the seventeenth century?) by Girolamo Martinelli located in Carpi (Italy). In this painting, Martinelli depicts the violone’s third thorough sixth strings in a deep brown colour and the higher two strings in white. 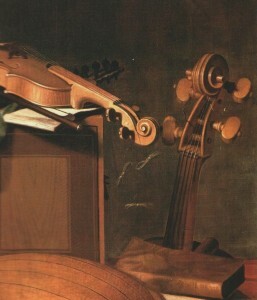 On thebass-violin depiced in the same painting, the bottom two basses are again brown, as in the violone, with the top two strings very light in colour and the second string nearly so. The last example about violin came out from a paint of Rutilio Manetti, Siena 1624 year, (Dublin, National Gallery). In the area of written sources, a passage in the Mary Burwell lute tutor (c. 1670) could not go unnoticed. 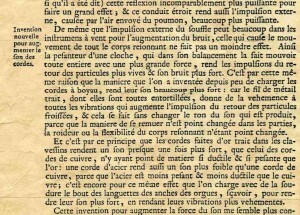 In chapter 16 dealing with two headed lute introduced by English Gaultier, the author complains about the problems caused by “…the confusion that the length of sound produce it alsoe…” and “…every basse sound make a confond with every string”. The above mentioned two headed lute is the one depicted in the well known portrait of English Gaultier and in many other 17th century Flemish sources. Such an instrument may perhaps be identified with the lute made by Raphael Mëst in 162…, now in the Linhöping library in Sweden, whose extended string length is less than 90 cm (26), roughly in line with the measurements given by J. Talbot for this type of instrument. At such vibrating length such an overpowerful persistent sound, so to make the anonymous author complain and lutenist revert to use lute without extension, is in no way justifiable, for unloaded natural gut strings, no in after what twisting method is adopted, which anybody can easily verify. Another source deserving attention is a report by Claude Perrault: (document 9) “…c’est par cette même raison que la maniere que l’on a inventée depuis peu de charger les cordes a boyau, rend leur son beaucop plus fort: car le fil de metail trait…” (27). The author refers to the new overspun bass strings giving however the impression he is talking about a new technological strategy for loading gut (i.e. the use of metal wire) in place of a more traditional one. As far as 17th century lute treatises are concerned, such as Robert Dowland’s (18) and Thomas Mace (10) for instance, the most interesting information (besides confirming more or less explicitly the strings smoothness) is the subdivision of strings in classes according to their specific use on the instrument. In Mace’s treatise, for instance, three classes are defined: strings suited only for treble registers and the higher basses octaves (Minikins, Romans), strings for mid-range registers and the other basses octaves (Venice catlins) and finally strings exclusively used for basses (Lyons, red Pystois) (28). This “acoustic specialization” of strings induces to get over the idea of just one manufacturing system, in favour of a complex technological diversity, indispensable to grant a finished product possessing the acoustical and physical features necessary, from case to case to obtain maximum tensile strength for trebles, high elasticity for middle registers and high specific weight for basses. Such a diversity could be achieved by the string makers of the time both by introducing new twisting techniques and by merely “chemical” means suited to increment, as much as possible, the acoustic disposition of natural material. Among this methods the use of aluminium salts (29) deserves mention, and above all, the sulphuration process, a millenary silk bleaching technique, also used by the anonymous Paduan string maker from the first half of the 17th century mentioned by Skippon (30), which seem to go well beyond the function of merely bleach the material, which is achieved in a matter of a few hours, any way. Instead the ancients kept this operation going for days, even; one could suppose a function similar to vulcanization of rubber, causing a loss of plastic properties in favour of elastic ones (31). A partial answer to this question will perhaps come from the results of chemical tests under way, which aim at verifying weather sulphur can actually fix itself into the collagen, the basic stuff of gut, thus building up disulphide links between the proteid filaments. The actual making of experimental loaded gut strings (32) went through a complex phase of quality standardization, which also included a careful study of treatises about dyeing and tanning of leather in use in the 16th and 17th centuries (33) and a long experimentation, through a some hundreds of tests, with such ancient dyeing and tanning baths (but obviously avoiding any toxic product). These experiments allowed us to discover the peculiar characteristics of the new strings, which could be then related to the historic information in our possession. The specific weight reached was about 2.90 , i.e. 2.3 times the density of plain gut which corresponds to a diameter 34% smaller than plain gut strings and 40% smaller than rope-construction strings, thus perfectly compatible with what was measured on the bridges of the examined historic instruments. The tone of the so obtained strings, as was to be expected, was rather dark, fundamental-heavy, bringing back to mind the only record in our possession by the English poet Edward Benlowes (1603-76), of how bass strings of the past might sound (34). A tone, in short, lacking a good part of the higher harmonics, which was to be made up for, at least as far as the lute is concerned, by the use of octave strings. It was however perfectly coherent with the “personality” of the higher untreated gut strings, achieving a natural extension towards the bass, unlike what unfortunately happens with overspun strings, which from the very outset suffered from serious tonal dishomogeneity (35). The smaller diameters (especially those smaller than 1.0 mm) showed, on the other hand, such a harmonics rich tonal response as to dispense with the need, for the lutes 4th 5th and 6th courses, for octave strings, in favour of a unison arrangement. It is curiously significant to notice how the use of stringing these courses with unisons began to spread roughly at the same time the custom of tuning the 7th course a fourth below the 6th came into use, and more in general, with the extension towards the bass in the late 16th century, first hints probably of a the availability of a new type of string. An iconographic hint to this may perhaps be found on the 7 courses lute in Caravaggio’s “I musici”, c. 1594-6 in the Metropolitan Museum of New York, where only the 7th course is a vaguely reddish colour. Where extended neck come into play, owing to the reduced diameters, a rather bright and persistent sonority was achieved, enough, that is, to cause the problems the Mary Burwell lute tutor’s author complains about. The tone on the other hand, became rather nasal. Used as bass strings on neck of limited extension, such as an eleven course baroque lutes for instance, the sound acquired a certain dark gravity almost percussive, which coupled in a perfectly homogeneous manner to the sound of the octave, also made of gut. Tests carried out on bowed instruments (violins, viola da gamba, violone and double bass) confirm essentially what already experimented with the lute, and suggested also to reduce, even substantially, the amount of loading for mid range strings (violin 3rd and gamba’s 4th) which sounded too bright. It was not necessary on the other hand to change the working tension normally in use. The breaking point instead, because of the loading process, underwent a decrease of 20÷25% compared to that of untreated gut, a minor problem for low register strings, which work at only a fraction of their total tensile strength. Anyway, the acoustic features shown by these strings inevitably led us to reconsider, for bowed instruments, the criteria for post positioning, hairs breadth and tension and the type of bow to be used. For today lutenist, they dispense to constantly stopping overspun strings in order to avoid unwanted dissonances. 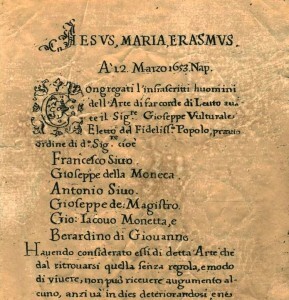 The contributions given by each of the disciplines examined and the iconography, from which only a few examples among many have been mentioned (36), historic documentation, original bridges measurements, and practical experimentation, allow us to draw a rather clear picture and, we believe, a convincing one. To confute the hypothesis of gut loading, the only alternative is to maintain that the basses of the lute -whose bridge-hole diameters were recorded- worked at a tension between 1 and 2 kg. I leave it to the reader to judge the credibility of such a theory, maybe after trying to play a lute with basses set at such tension. However, we should not forget that the heart of the matter lies in what plausible answer alternative to gut loading can satisfy the evidence? Or should we really believe it possible, in the face of hard facts, that a thick unloaded plain gut string, at a working tensions of less than 2 kg, could actually produce a satisfactory sonority in lower registers without sounding like a rubber band? As far as lute bridge-holes are concerned, we believe that they can be taken as proof. Such research has been extended to the talpieces of bowed instruments, although originals are hard to find. The bridge and tailpiece-hole diameters found on original instruments factually represent a universal yardstick employed undoubtedly by the luthiers of the past to fit any sort of gut bass strings then available on the market. Thus the technological matrix common to Lyons, Pistoys, and Dowland’s Catlins can only be identified with the loading of gut. b = 2.22 the VI. b = 1.79 the VI. b = 1.00 Bridge not original? Mr. Ivo Magherini for the English translation from the Italian original (plus a couple of suggestions) and for his kind collaboration Dr. Francesco Tribioli. 1) François de Troy (1679-1752): Portrait of the luthenist Charles Mouton, c.a. 1690, The Louvre Museum, Paris, ref. 2469. 2) D. Abbot, E. Segerman: “Strings in the 16th and 17th centuries”, The Galpin Society Journal nº 20, July 1974. 3) D. Abbot, E.Segerman: “Gut Strings”, F.O.M.R.H.I. Bull nº 1, comm 3, November 1975. 4) D. Abbot, E.Segerman: “Catline strings”, F.O.M.R.H.I. Bull nº 12, comm 138, November 1978. 5) C. Besnainou: “Les cordes et leurs mysteres”, “Tablature” Revué de la societé Française du luth, Juillet 1987. 6) F. Eyler: “The modern Venice Catlines reconsidered”, Lute Society of America Bull., August 1986. 7) Roman Strings Makers’ Guild: Statute; year 1642, Biblioteca Angelica, Roma. 8) Statutes of Neapolitan String Makers; years 1653 and 1685, Archivio Nazionale di Napoli. 9) J. Playford: “Introduction to the skill of Music”, London, 1664. 11) M. Prynne: “James Talbot’s Manuscript: IV, Plucked strings. The Lute family”, The Galpin Society Journal nº 14, 1961, pp. 59-60. 12) T. Mace (ref n.9) wrote: “… There is another sort of strings, which they call Pistoy basses, which I conceive are other than thick Venice Catlins, which are commonly dyed with a deep dark red colour…”. 13) E. Segerman: “String tension on Mersenne’s lute”, F.O.M.R.H.I. Bull. nº 11, comm. 129, April 1978. 14) E. Segerman: “A closer look at pitch ranges of gut strings”, F.O.M.R.H.I. Bull nº 40, comm. 632, July 1985. 15) E. Segerman: “On baroque lute stringing and tunings”, F.O.M.R.H.I. Bull nº 16, comm. 215, July 1979. 16) W.R. Thomas and J.J. Rohodens: “The strings scales of Italian keyboard instruments”, The Galpin Society Journal nº 20, 1967 p.48. 17) “The Mary Burwell lute tutor”, ca. 1670, R. Ranstall’s facsimile, introduction by R. Spencer, chap. 4: “Of the stringes of the lute”. 18) R. Dowland: “Varieties of lute lessons”, London 1610. 19) R.F. van Pelt: “A string formula”, F.O.M.R.H.I. Bull. nº 9, comm. 81, October 1977.
where: t = tension in Kg; F = frequency in Hz; ? = density (for gut 1.3 ); L = vibrating length in m.; d = diameter in mm. 20) E.G. Baron: “Historische Theoretisch Und Practische Untersuchung Des Instruments Der Lauten”, Nürnberg, 1727. 21) E. Segerman: “On German, Italian and French pitch standards in the 17th and 18th centuries”, F.O.M.R.H.I. Bull. nº29, comm. 442, October 1982. 22) A. Mendel: “Pitch in western music since 1500: a re-examination”, Acta Musicologica nº50, I/II pp. 1-93. 23) For every standard of frequency taken by considerations, attain the corresponding f’ frequencies of top string. Two semitones above of these, there are respective breaking frequencies. The product with the vibrating length give us breaking index K that for breaking point of 32 is equal to 246 .. By a no complicate proportion, we can obtain every breaking point. If the interval between working frequency and breaking frequency is equal to a single semitone, breaking points will change between 28 and 35 ; 34÷39 if this margin is three semitones. 25) “Early music”, October 1982: see cover. 26) O. Vang: “Two headed lute news”, F.O.M.R.H.I. Bull. nº 13, comm. 156, October 1978. 27) C. Perrault: “Œuvres de Physique”, Amsterdam 1727, British Library, London. 28) A painting by Louis de Sylvestre (portrait of a lutenist at Saxony court, ca. 1724) represents an interesting iconographic support of Mace indications. The strings of courses from I to IV and the octaves of courses from VI to VIII have a blue colour, the V course and the remaining octaves (it was an 11 courses lute) have a white colour, besides the bass strings of courses from VI to XI all have an orange colour. The Talbot violin as well follows strictly this track: high range Romans, mid range Venice Catlins, bass range Lyons. 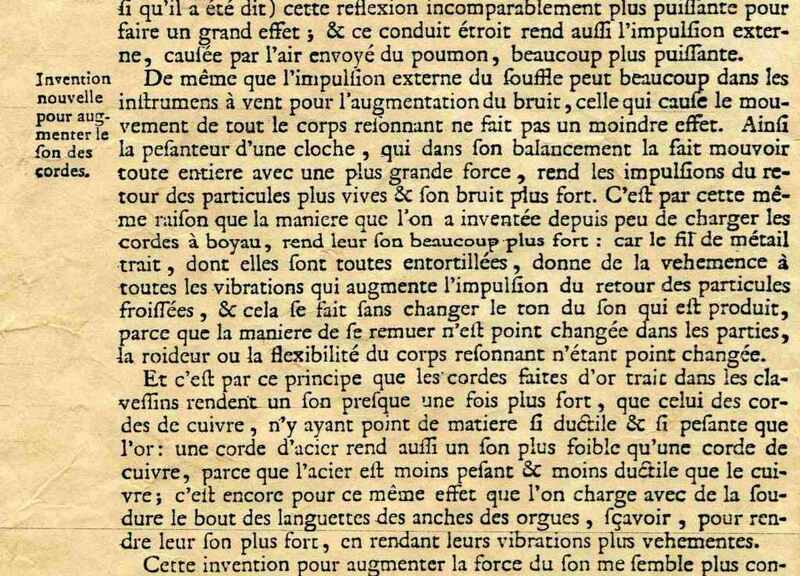 29) According to Labarraque (Antoine Germain Labarraque: “L’art du Boyaudier”, Paris 1822, Biblioteque National Paris) the function of aluminium salts is to facilitate the sedimentation of the ashes used in alcaline baths employed to degrease the fresh gut. 30) P. Skippon: “A journey thro’ part of the Low-Countries, German, Italy and France”, A. & J. Churchill, A collection of voyages and travels, London, 1732, pp. 532-533; cited by Jan Woodfield in the Lute Society Bull. 32) M. Peruffo: “New hypothesis on the construction of bass strings for lutes and other gut strung instruments”, F.O.M.R.H.I. Bull. nº 62, comm. 1021, January 1991.
and by the same author “Il mistero delle corde gravi del liuto: nuove ipotesi di lavoro”, Bollettino della Società Italiana del Liuto nº 2-3, October 1991 – January 1992. 33) In one of these there is a curious recipe to make harmonic strings: “Take the tendons of a horse’s back which you will have pounded in a cloth with a wooden mallet until they become soft, then have them twisted well together with animal glue. 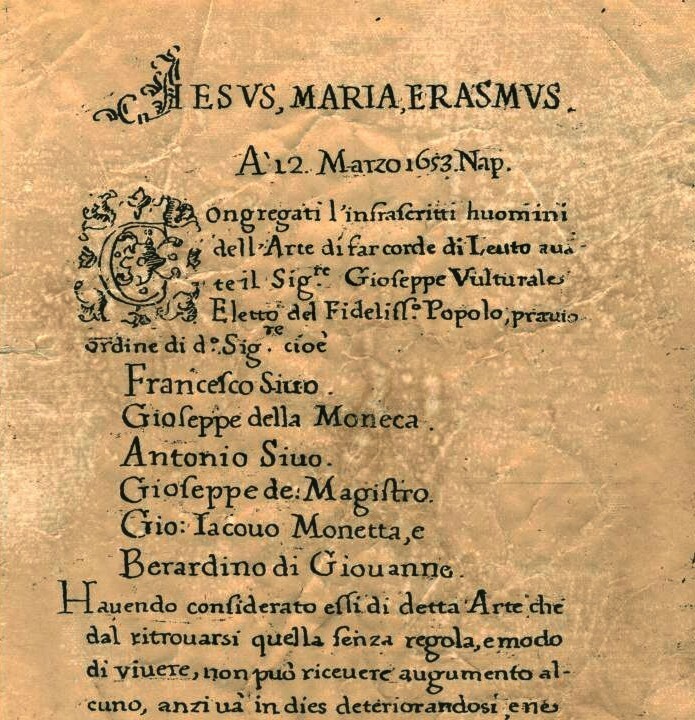 Then dried them and they will be very strong and good strings and they will been almost of silk…” Don Thimoteo Rossello: “Summa de Secreti Universali”, Venezia 1574, Libro Sexto, cap 123, p. 151, Biblioteca Universitaria, Padova. 34) “…still torturing the deep mounth’d Catlines till hoarse thundering diapason should the whole room fill…” cited by Frank Eyler in: “Sur l’employ des cordes en boyau”, Musique Ancienne nº 15, Janvier 1983, pp. 29-31. 35) Forqueray’s letter to Prince Friederich Wilhelm in 1768, on bass viole stringing: “… the fourth which is C should be half covered with a very fine covering, and the others completely covered with the same covering and never double covered”. Trans. by Lucy Robinson in: “Le basse de viole”, 1975, Fitzwilliam Museum, Cambridge. Cited by E. Segerman in F.O.M.R.H.I. Bull nº 15. comm. 15, April 1976.